Another week, another first time winner. Andrea Pavan followed Richard McEvoy and Paul Waring as the third player to recently claim their maiden victory on the European Tour after more than 100 starts. For Pavan it was 112th time lucky after five birdies on the back nine helped him set a new tournament record of 22-under-par and win the title by two shots as he overcame Padraig Harrington to win at the D+D Real Czech Masters. "This win feels unreal!," Pavan wrote on social media afterwards. "I cannot believe how far I have come in just 12 months. A massive thank you to my wife, my family, my coach, my caddie and everyone who helped me get here on a Sunday afternoon to hold this trophy!" Pavan and Harrington began the final round tied for the lead, but it was the three time major champion that quickly pushed ahead, opening up with a three shot lead by the turn. From there, Pavan found a different gear as he opened up with birdies on the 10th and 12th holes to reduce the gap to one. By the 15th a dropped shot from Harrington brought the pair level, and Pavan went on to birdie both the 16th and 17th holes to move two shots clear with one to play. On the final hole, a par was enough to secure a two-shot victory for the Italian. "It's amazing, it's massive," he said. "I've won four times on the Challenge Tour but it was a long time ago. I'll enjoy this one because it's really hard to get and I'll just keep working on the stuff that seems to be working and enjoy the success." 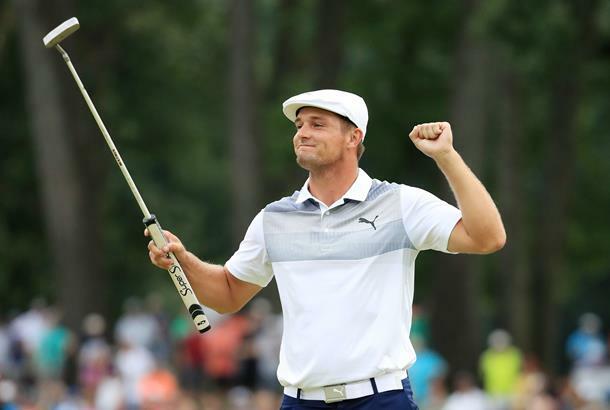 Bryson DeChambeau boosted his Ryder Cup chances once more as he cruised to his second victory of the year at The Northern Trust in New Jersey and moved to the top of the FedEx Cup standings. "I'm super stoked to be No. 1 right now, and see what next week and the weeks after hold." The 24-year-old posted a final-round two-under 69 to win the first play-off event by four shots over fellow Ryder Cup hopeful Tony Finau. DeChambeau's third round 63 propelled him to the top of the leaderboard with a four shot advantage, and back to back birdies on his opening two holes of the final round gave him a cushion it looked unlikely any player could threaten. Two dropped shots on the third and ninth holes pushed him back to 16-under-par, and it was then Aaron Wise made the biggest move - getting to within two shots after four birdies from the 10th to 14th holes. But while Wise went on to bogey both the 15th and 16th, DeChambeau once more extended his lead with back to back birdies from the 12th, before parring his way in to claim his third PGA Tour title. "It's amazing," DeChambeau said. "This one was different. I had to grind out a couple shots at the end. Wasn't expecting a couple of the shots I hit; a little nerves here and there." "Not really knowing what to do under the gun like that with that tremendous of a lead, I'm kind of trying to protect a little bit. It was a big learning experience for me." Tiger Woods and Phil Mickelson is the match-up we were expecting thanks to months of talks and teasers about the idea, and now the winner-takes-all 18-hole match-play has been confirmed to be taking place on Friday 23rd November at Shadow Creek Golf Course, according to ESPN. Woods posted the announcement on twitter on Wednesday, simply tweeting a picture of the pair and the words 'It's on'. Mickelson, who was finally persuaded on to twitter earlier in the day, responded to the 14-time major champion Woods with a quick quip as the duo entered in to an exchange on the social media platform to promote the event. Phil: "I bet you think this is the easiest $9M you will ever make"
Tiger: "Think you will earn some bragging rights?" Phil: "Let's do this #TigerVsPhil"
While earlier reports indicated the pair would be playing for $10million, Phil's response makes it appear it will no be for $9million dollars - likely decreased so that it was lower than the $10million prize money awarded to the winner of the Fed Ex Cup. It's unclear as yet how viewers in the UK will be able to watch, but will be a pay-per-view broadcast on Turner's B/R Live in the USA, which is the company's new premium live sports streaming service. Bryson DeChambeau made the biggest move of the week, charging to the top of the FedEx Standings and dislodging Dustin Johnson from the top spot. But at the other end of the standings, players needed to make in to the top 100 in order to ensure they would make it to play at TPC Boston this week. Here's who is in, and who is out of this week. Hatton struggled with his putter on Saturday, making just two birdies all day despite hitting 14 of 18 greens. He tweeted after his round: "Tee to green was fine just can't find the hole." As a response, Hatton took a trip to the local N.J Golf Galaxy and bought a new Ping model for $172 according to the receipt he posted on twitter. It turned out to be a good purchase, as he gained nearly three strokes on the field with his putting on Sunday as well as carding the best round of the day (a seven-under 64) to move in to the top 20 for the week. He called it "the best $172 I've ever spent." Brooke Henderson became the first Canadian to win the CP Women’s Open in 45 years on Sunday after finishing at 21-under-par thanks to a closing 7-under 65. For 20-year-old Henderson it was a four-stroke victory at the Wascana Country Club, concluding with a short-birdie on the par-four 18th for the title. It was a big week for European players hoping for automatic qualification, while plenty of American players were aiming to grab the attention of Jim Furyk. Byrson DeChambeau did just that with his victory, claiming The Northern Trust title by four shots over fellow Ryder Cup hopeful Tony Finau - who posted his fourth top 10 in eight starts. Afterward, DeChambeau was asked if he felt he had sent a message to Ryder Cup Captain Jim Furyk. He responded; "I said I was a man on a mission yesterday, and hopefully he can see that I've got some grit and grind, and that even when I don't execute certain shots, I can get it done." At the D+D Real Czech Masters, Thomas Pieters and Eddie Pepperell took a share of 9th place. For both players it was a third top 10 in four starts, increasing each player's chances of making it in to the team - though at the moment both will need a wildcard pick as it looks like neither can now have a chance of gaining one of the eighth confirmed spots. There is just one more week until the top eight places are confirmed for Team Europe on September 2nd, and Captain Thomas Bjorn will then announce his four selections during a live show three days later on Wednesday September 5 on Sky Sports Golf at 2pm. Eddie Pepperell decided to give a fan his lob wedge at the D+D Real Czech Masters, and his reasoning was very simple. Phil Mickelson had a BIG week. He finally joined twitter, announced a $9million winner-takes-all contest against Tiger Woods, almost had an ace and finished T15 at The Northern Trust. His twitter account was basically everything you could have wanted. PLENTY of gifs, pictures of him and Pat Perez comparing hair, and some smack talk directed at Tiger Woods. Below was his first tweet. For the rest, make sure you follow him here. Jordan Spieth gave viewers the ultimate 'don't try this at home' moment at The Northern Trust on Friday. The three-time major champion went to tap in for a double bogey with just one hand. Instead, he barely moved it an inch and was left with a costly triple bogey from nowhere. On instagram, he wrote underneath the PGA Tour's post: "Don't try this at home kids"